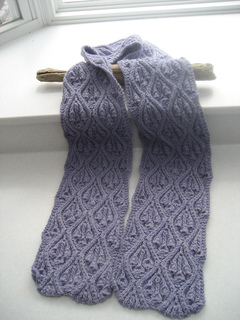 Scarf is knit in two halves then grafted at center, so that pattern appears right-side-up when both ends hang in front. Edges can be blocked with scalloped edge, or blocked with straight edge. 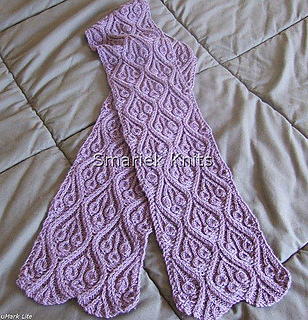 I’m not entirely sure how much yardage went into this scarf as there was some discrepancy between yardage printed on the label and yardage measured by Elann, but I’d take a guess at around 500 yds. 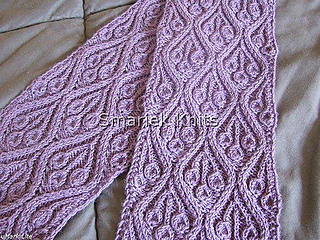 More photos and info in blog post, http://smariek.blogspot.com/2008/04/marijke.html.